Representative examples of the spectrum of HD 64315 at four different phases. Spectra are numbered for ease of identification. Credit: Lorenzo et al., 2017. A group of astronomers led by Javier Lorenzo of the University of Alicante, Spain, has discovered that the binary star system HD 64315 is more complex than previously thought. The new study reveals that HD 64315 contains at least two binary systems composed of massive stars. The findings appeared online on Aug. 2 in a paper published on arXiv.org. HD 64315 (also known as HIP 38430) is the main ionising source of the Galactic H ii region Sh2-311. It was initially classified by previous studies as a binary star, located some 16,000 light years away from the Earth. However, a new study conducted by Lorenzo's team reveals breakthrough information about this stellar system. The researchers have analyzed over 50 high-resolution spectra of HD 64315 obtained during previous observations and also photometric data from All Sky Automated Survey and Hipparcos catalogs. This analysis revealed strong signatures of more than two components present in the spectra, indicating that HD 64315 is, in fact, a multiple system comprising at least four components. 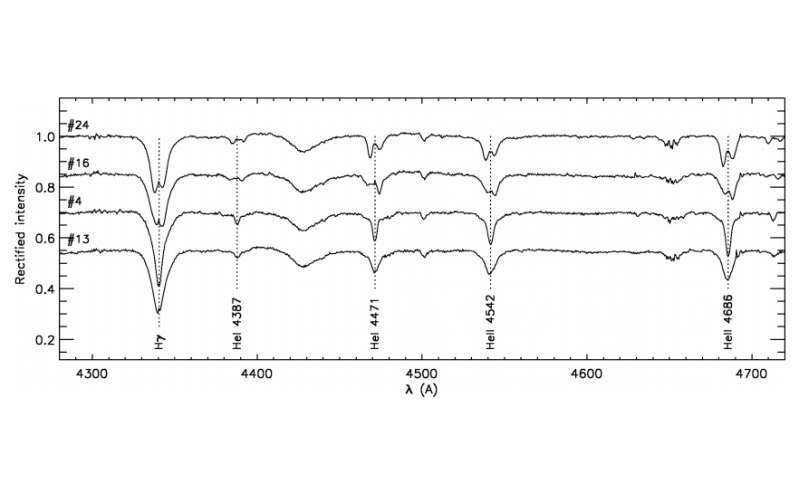 "By using a complex procedure to analyse 52 high-resolution spectra, we are able to confirm that HD 64315 contains two binary systems, one of which is an eclipsing binary," the paper reads. According to the research, HD 64315 is composed of at least two binary systems, one of which is an eclipsing binary. The two binaries are located about 500 AU from each other. HD 64315 AaAb is the non-eclipsing binary with an orbital period of 2.7 days. Both components of this binary have minimal masses of at least 10 solar masses, but most likely about 30 solar masses. The eclipsing binary was designated HD 64315 BaBb and has a much shorter orbital period which equals approximately one day. Both stars of this binary have a similar mass of about 14.6 solar masses. The researchers found that HD 64315 AaAb's components are hotter than those of the eclipsing binary, and dominate the appearance of the whole system. They estimate that HD 64315 has a total mass of above 90 solar masses. Notably, the eclipsing binary is one the most massive overcontact binaries known, a likely merger progenitor in a very wide multiple system. The team does not exclude the possibility that HD 64315 could be a compact cluster in which most of the mass could be concentrated in the two observed binaries. "Lower-mass components would not be observable in the glare of this very bright system. However, in any case, it is highly unlikely that HD 64315 is surrounded by a cluster with about 1,000 solar masses, as is usual for other O6 V stars," the authors noted. In concluding remarks, the researchers emphasized that HD 64315 is potentially a massive hierarchical system that formed in a sparse environment, which highlights the need for detailed studies of multiplicity in apparently "isolated" stars. "HD 64315 provides a cautionary tale about high-mass star isolation and multiplicity. Its total mass is likely above 90 solar masses, but it seems to have formed without an accompanying cluster," the scientists concluded.